The Braves announced this morning that they’ve signed manager Brian Snitker to a two-year contract extension that includes a club option for the 2021 season. MLB.com’s Mark Bowman had indicated earlier this morning that Snitker’s widely anticipated new contract was expected to be announced today (Twitter link). Snitker, 63 on Wednesday, took over as manager on an interim basis back in 2016 after the Braves dismissed Fredi Gonzalez on the heel of a 9-28 start to the season. While he only took over on an interim basis, Snitker impressed the former front office enough that he landed a modest one-year extension with a 2018 option following his initial run at the helm. Even following the resignation of GM John Coppolella and the departure of former president of baseball operations John Hart, though, Snitker has done enough that the new-look front office, headed by general manager Alex Anthopoulos, will retain him for another few seasons. 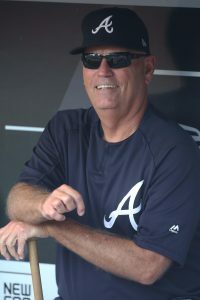 The 2018 Braves surprised many by winning 90 games and capturing the National League East division title, making an extension for Snitker nearly a foregone conclusion. Snitker and his staff enjoyed a potential Rookie of the Year-winning campaign from Ronald Acuna, while Ozzie Albies, Johan Camargo, Mike Foltynewicz and Sean Newcomb all enjoyed varying degrees of breakouts. Meanwhile, franchise cornerstone Freddie Freeman had yet another excellent season, while veterans Nick Markakis and Anibal Sanchez each enjoyed their best seasons in a half decade. Catchers Kurt Suzuki and Tyler Flowers enjoyed solid seasons as well. If there’s one area that the Braves need to improve moving forward, though, the pitching staff stands out as the most obvious. Specifically, no team in baseball yielded a higher walk percentage than Atlanta, as the Braves walked a staggering 10.3 percent of the hitters they faced. Braves hurlers did check in 12th overall with a strong 23.1 percent strikeout rate, but the free passes proved to be too substantial an obstacle to overcome — especially in the National League Division Series, when the pitching staff doled out 27 walks while falling to the Dodgers in a four-game loss. That could potentially lead to some coaching changes, as Bowman suggested this morning that pitching coach Chuck Hernandez could be on the hot seat (Twitter link). There’s no word on that from the organization just yet, but clearly Snitker’s strong work to date and the relationships he’s built with the team’s impressive young core have earned him a longer run as the skipper in what should be an extended period of competitive baseball for the Braves. I’m not even a Braves fan and can tell you that the Braves are in a MUCH better spot moving forward than the Dodgers. I think he was referring to the error in the article, not slighting the Braves. Dodgers have just as much young talent and more money to spend than the Braves. Not saying the Braves will be bad but “much” better spot lol. “MUCH better spot…than the Dodgers” does not mean “much better than the Dodgers”. Both teams are in a good spot with a good young core that is cost-controlled for a few years. That being said, ATL needs to find compliments on the free agent market now to really compete – something they haven’t done (or been able to do) since Wren handicapped us and jumpstarted the rebuild with a line of awful contracts/extensions that included Derek Lowe, Kawakami, Uggla (extension), Chris Johnson (extension), Melvin BJ Upton, etc. He gets credit for extending Kimbrel and Simmons, but it was all for naught when there was more damaged that prevented us from prevented them from reaping the benefits (Kimbrel packaged with Upton, Simmons traded for young pitching). Braves cannot do all they need to do via Free Agency. They will have a mixture of FA deals along with trades using the cache of young arms we have as capital. trio to build around but LA has a pretty good core in its own respect. Walker buehler might be the best young pitcher out of all the arms in either system. Though I like Soroka a lot to. Bright future either way. How do you figure? Your comment makes zero sense. It’s possible. Look at the twins. He’s trolling for sure but the comment may not be outlandish depending on what they do this off season. If you remember the Astros made the playoffs earlier than expected a few years ago and than took a step back the next year before moving two steps forward. My point is if the Braves decide to move on to their core of young pitching in the rotation and bullpen they probably will experience some rough patches during the year. It’s unfair to constantly expect rookies to perform at veteran levels. If they go and make some moves than I think the keep getting better. Congratulations to Snit! Great year and many more to come. Apologies. Early morning brain malfunction. Wrong NLDS floating through my head while typing that sentence. I like this, especially after hearing all the comments from the players holding Snitker in high regards. The Braves lost in four to the Dodgers not in three as this article suggests. Would be surprised to see Chuck Hernandez come back as pitching coach. He’s been here long enough and time to get a fresh perspective. They didn’t change pitching coaches going from Fredi to Snitker. I hope Wash comes back though. He was instrumental in the infield defense (i.e. Swanson), and he would be important helping Riley transition to 3B defensively, if they plan to play him there with Camargo. Odd, different roster same results, lost to dodgers in nlds. Good for him. He’s worked hard to get this shot and he’s making the most of it. Washington would be a huge loss. I hope he comes back actually I pray he comes back. Also I don’t know about Hernandez I am torn on that. On 1 hand the walks are a problem on the other hand how much would a better catcher help ? I am definitely not super impressed with Chuck but the pitching staff did hold its own and who would actually be the replacrment ? Coaching, like managing, is more a matter of the “right time, right place” than of any abilities. The Rays changed from Jim Hickey, a very good pitching coach, and moved onto Kyle Snyder, who just meshed with their young staff better. Chuck’s ben around for a while, and frankly some of the Braves’ pitchers didn’t advance as quickly as one might like. Might need some fresh air there. Doesn’t mean Hernandez is a bad coach at all. You can’t coach (or manage) on a “one size fits all” philosophy; not sure you ever could. As Bucky always says, some guys need a pat on the back, others need a kick a little lower. And of course, as I was typing this, they dismissed Chuck…..
That’s an odd comment. Folty, especially, finally put it all together this year after years of failing under other pitching coaches, and Newcomb progressed by leaps and bounds, plus Anibal Sanchez had a nice mini-comeback. Hernandez must have some issues behind-the-scenes with the rest of the staff or a philosophy they don’t agree with, but the Braves pitching was pretty good in 2018. Die Hard Braves Fan since 1982 (I was 10 years old growing up in Arkansas when I first started following The 1982 Braves on WTBS). I’ve been ‘hooked’ ever since (through THICK and THIN, lol). 12. Kevin Gausmann…SP ($9 mil….1 more year before Free Agency….could be traded IF he wants ‘too much’. He could sign some type of 2 year contract that pays him something like $20 mil over 2 years…kind of like how The Braves did with Jason Heyward when he was 2 years away from Free Agency). According to my math….The 5 Starting pitchers of Folty/Newcomb/Gausmann/4th/5th starters coming from our PLETHORA of high upside pitching prospects…will total $16.9 mil in 2019. Those 22 postions….will total $70.8 mil….leaving $79.2 mil to fill the holes that Left Field/3rd base/Catcher presents. Personally…..I like the first option (trading for Realmuto….going ALL-IN by signing BOTH Harper AND Machado). The Braves would be SERIOUS CONTENDERS for years to come with that lineup! If a team is making The Playoffs EVERY YEAR…..the payroll CANNOT stay the same. It HAS to go up! The young talent that The Braves have……would keep our pitching costs low (prime example….there’s a chance that Gausmann, no matter how good he pitches in 2019…..will be a trade candidate next offseason…because The Braves have A PLETHORA of young, high upside Starting Pitching talent coming up The System! Heck, Gausmann may end up being traded by The July 2019 Trade Deadline….IF some of our AAA pitching studs ‘force the issue’. Why give Gausmann a raise on his already $9 mil 2019 Salary…IF a young prospect has the potential to pitch BETTER? That move there…is how money can be trimmed from The 2020 Payroll! Bro. I’m sure you put a lot of effort into that post but it was just too damn long. Break it up into a couple posts because I saw about 3 different lineups proposed on there. I did read about Gausman. No shot Gausman would sign a 2 year 20MM extension. He’s going to eclipse that easily in an Arb raise in 2020. Very little incentive for him to do something like that at this point when pitchers like him rehabbing a TJ get 2/10 nowadays. You’re also not getting realmuto for Riley and a “2nd tier pitching prospect “ it’s gojng to hurt a bit more than that. 1. I said ‘if’ Gausman was willing to sign a 2 year/$20 mil contract (he’s probably going to get around $8-$9 mil for 2019, meaning that depending on how he does in 2019, he could be eligible for around $11-$12 mil in his last year of arbitration). Regardless, I dont see Gausman staying with The Braves past 2019…because we have A PLETHORA of high upside pitching prospects who will have 3 years of pre-arbitration (making around $600k a year) who have more ‘swing and miss’ stuff than Gausman does. Just like Teheran and his $11 mil 2019 salary will be traded this offseason…..Gausman and his increasing 2020 salary will be traded next offseason. 2. I did not say that Realmuto would only cost Riley and ‘a 2nd tier pitching prospect’. I said “Riley AND a couple of 2nd tier pitching prospects’. With only 2 years of arbitration left before he becomes a Free Agent….The Marlins ARE NOT going to be able to get ‘a king’s ransom’ for Realmuto. That’s why Riley and a couple of 2nd tier pitching prospects (in other words, Soroka and Touki WILL NOT be heading to The Marlins in any Realmuto trade). Teams ARE NOT giving up any of their best prospects ANYMORE. Look at this past July Trade Deadline. No Top 20 prospects (or even Top 50 prospects, that I was aware of) were traded this past July! Look at what The Astros gave up to get Gerrit Cole this past offseason (who had a couple of years left before he becomes a Free Agent after The 2019 Season). The Astros gave up 4 prospects to get Cole…however NONE were even close to being their best prospects. What did The Marlins get for Christian Yelich and Ozuna? Brinson was really the only ‘named’ prospect they got back in return…and he’d already lost some of his ‘luster’ before The Brewers even traded him. Trades DO NOT get the prospect return now days….that they used to. The haul that The Yankees got back in 2016 for trading Chapman and Andrew Miller….cemented what was already a growing trend in MLB (giving up your best prospects for a rental OR someone with limited years of control…IS NOT a wise move to make). The Marlins can either wise up and get what they can for Realmuto..OR..risk getting nothing in return for him IF he gets hurt. Austin Riley has power potential…..can provide some power for the middle of their lineup while making only around $600k a year in each of the next 3 years (along with a couple of 2nd tier pitching prospects who can possibly develop into decent MLB pitchers down the line). However they are DREAMING if they think they can get Riley AND Anderson, Soroka and Tousiant…for Realmuto, lol! 3, I made a long detailed post…because I needed to explain the math involved in 2 types of moves The Braves could make. I posted ‘several’ lineups….because both detailed hypothetical lineups that reflected the moves I pondered in my post. One lineup was with The Braves keeping Austin Riley…along with signing Bryce Harper and Yasmani Grandal. The other lineup was trading Riley (and a couple of 2nd tier pitching prospects) for Realmuto….and with The Braves signing BOTH Harper and Manny Machado. I explained how The Braves could make both payrolls work…which required some ‘explaining’, lol. Just post the summary version. You spent way too much time on a post no one is going to read, and even if someone did which essay portion is someone to comment on? Or would a commentor have to write a novel as well?